The objective of this investigation was to determine the effect of technology on attention and achievement within a classroom context, taking motivation and concentration into account as well. Lessons in Geography, English and Mathematics were presented to an experimental and a control group consisting of 23 and 22 Grade 8 learners, respectively. Technology was implemented for the experimental group but not for the control group. Significant differences were found between the average achievements of a group of learners, exposed to technology during a lesson, compared to a group not exposed to technology. Significant differences were also found between the average attention of a group of learners, exposed to technology during a lesson, compared to a group not exposed to technology. A high positive relationship was obtained between motivation and concentration and moderate to high positive correlations were obtained between attention, concentration and motivation, taken jointly as independent variables and achievement as the dependent variable. Essentially classroom teaching consists of a teacher who teaches and learners who learn. The simplicity of this relationship is influenced by a number of factors, both external and internal, which have an effect on the significance and the excellence of teaching and learning. The amount of time and effort spent in a classroom is worthless unless the learners are learning. This is manifested within the concentration span in a classroom. Referring to Figure 1, a relationship (R1) exists between the teacher and the learner. This relationship is targeted at learning. In order for learning to take place, the teacher makes use of a method of focusing the learner's attention on the target. Focus is seen here as zoning the learning's attention on the specific pre-chosen target. A relationship (R2) therefore exists between the teacher and the target with the aim of leading to a relationship (R3) between the learner and the target. When a learner shifts his/her focus correctly on the intended target, his/her attention is captured. This attention, when sustained over time develops into concentration. As can be seen in Figure 1, concentration can be lost at any time in which case it diverts back to attention (symbolised by the double arrowed lines) which is then focused elsewhere on a new target. This target is often not the one intended by the teacher. The teacher therefore needs to continually focus the learner back onto the required target (R4). 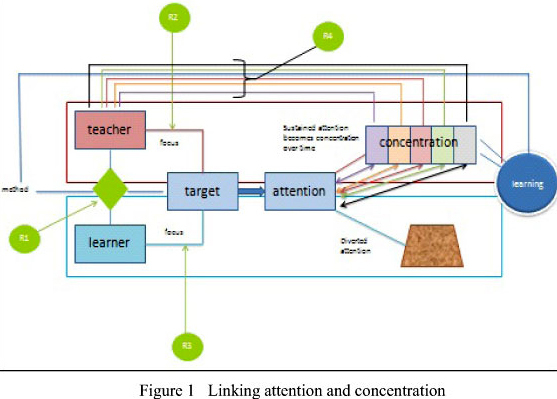 If the learner's attention is focused on the required learning material, and the learner maintains this focus of attention over a period of time, this prolonged or sustained attention is concentration. Anderson (2002) as cited by Tsang, Kwan and Fox (2007:12) states that meaningful learning can be achieved as long as one of three forms of interaction (student-teacher; student-student; student-content) is at a high level. The oldest definition of attention can be traced back to William James (1890) as cited in Styles (2006:1) who suggested that it is "the taking possession of the mind in clear and vivid form ... it implies withdrawal from some things in order to deal effectively with others" (Perry, 1935:18). This explanation still serves today to encompass an effective definition of the word, attention. James (Friedenberg & Silverman, 2006: 75) suggested that substantive thought occurs when the mind slows down, perhaps when attention is focused. Vigilance has therefore often been thought of as the essence of attention, according to Neisser (1976:27). Attention is also defined as a system of cognitive control in which the vast amount of information processed by the cognitive system is reduced to a tolerable extent (Ackerman, Kyllonen & Roberts, 1999:162). Focal attention is when attention is orientated towards a particular locus in space. This is also known as spatial attention. If attention is orientated on an object, by means of the use of one or other sensory organ, including visual, auditory, smell or taste, it is called object-oriented attention. The focus of attention can be controlled in a goal-driven or a stimulus-driven manner for both spatial and object-oriented attention. Concentration can be defined as that faculty of the intellect which focuses single mindedly on one object without interruption. It must be emphasized that true concentration is a wholesome one-pointedness of mind, "forcing the mind to remain on one static point" (Gunaratana, 1994:89). The art or practice of concentration is to focus on the task at hand and eliminate distraction. If these two definitions were to be combined and tweaked specifically for school purposes, we could probably conclude that concentration is the skill needed by a learner to focus on the lesson for a period of time without allowing one's thoughts to be distracted. Concentration can be summarised as complete attention using intense mental effort (Wikipedia, 2009). Concentration assists one to confine one's thoughts to relevant stimuli in the presence of irrelevant stimuli. The critical factor in the learning process, according to Hale and Lewis (1979:33) is attention. Unless the attention of the learner is captured, optimal learning will not occur. Teachers need to capture the attention of learners during a lesson, irrespective of their learning style and, if the attention of learners tends to wander, teachers should be able to shift rapidly to a new activity to capture it once again (Rinne, 1997:131). It is therefore important to determine what appeals to different learners during a lesson and in this context the use of technology would certainly be an option to consider. In a dated but still relevant document Wallington (1977:21) defines technology in a teaching context as a complex, integrated process involving people, procedures and devices in situations in which learning is purposive and controlled. Purposive learning is learning in which someone else has determined that learning is to occur within a learner and the purpose of such learning has been specified in advance. Controlled learning is learning in which the learner's behaviour is determined and managed by someone else. Part of the management process may include the use of technology. Technology is used to facilitate human learning through the systematic identification, development, organisation and utilisation of a full range of learning recourses and through the management of these recourses. It can be described by the material it uses and by describing what practitioners do with it (Wallington, 1977:93).  to read, view or listen to an informative presentation using CD-ROM, Web browsers, CD players, MP3 players, Powerpoint presentations, etc.  conducting interviews or debate issues using audio-visual conference facilities, e-mail, Skype, etc.  developing a presentation using power-point or video recording. Harris et al. (2009:393-416) emphasise that the use of technology in a classroom can only be successful if pedagogical principals are taken into account. Before a teacher decides to use technology he/she should verify pedagogically which content should be taught in differentiated ways, according to students' learning needs, which concepts are difficult to learn, and how technology can overcome conceptual challenges. Teachers should have knowledge of learners prior content-related understanding and how technology can be used to build on existing understanding in order to master new and more sophisticated content. No technology is able to replace the teacher in the classroom. It can however be successfully integrated into lessons which could maximise the learning experience since technology has become an integral part of the life world of today's learners. Presently, the world is filled with technology and has marketing ploys aimed at attracting today's teenagers. Many students have become visual learners, having been brought up with technology, so without visuals in a presentation the learners may not learn effectively (Smaldino, Lowther & Russell, 2008:259). Present day students are more used to absorbing information from the screen than from the printed page, and they find teachers who use technology to be more reliable and knowledgeable than those who do not (Lytras, Gasevic, Ordonez de Pablos & Huang, 2008:189). Since children are used to ongoing stimulation in order to attract attention outside the school context, the question arises whether the classroom environment succeeds in doing so as well. Literature from educational research supports the claim that using visuals in teaching results in a greater degree of learning, as the learners seem to concentrate better and for more sustained periods of time (Sims, O'Leary, Cook & Butland, 2002:129; Ainsworth & Loizou, 2003:675). Felder and Soloman (2001), as cited by Bitter & Legacy (2008:23), also point out that learners retain more information with the help of sufficient visual content in their learning materials. Bitter and Legacy (2008:152) who investigated the effects of technology on reading comprehension found that learners tend to be more intrigued with the visuals and animations offered by the use of technology. Students have higher comprehension scores after reading the electronic stories versus reading printed texts. The interactive effects of sound, animation, narration and additional definitions that make up electronic texts motivate students to want to read the stories again, which happens less often with printed text. The ease of access is also advantageous to the reader. The use of technology has the potential not only to maintain attention but also to motivate learners to pay attention. Shelly (2004, Chapter 6:8) established that technology has the potential to increase student motivation and class attendance which is an important aspect since so many of today's students from advantaged homes and families are not interested in learning or are not motivated to achieve (Barr & Parrett, 2008:6). Prensky's belief is that the high school experience in particular is a source of profound boredom for many teenagers who are usually engaged in some form of technology (Willougby & Wood, 2008:106). The British Institute for Learning and Development recently adapted a slogan from a teenager who was overheard saying "When I come to school I have to power down"! Prensky argues passionately that with the use of technology, students can be motivated to be involved in learning activities similar to their involvement in computer games. Good designers of computer software are practical theoreticians of learning. They succeed in facilitating learners to exercise their learning skills without knowing it and without having to pay overt attention to the matter (Willougby & Wood, 2008:46). One can only agree with Jewitt (2006:161) that technology is reshaping knowledge, literacy and pedagogy in the present day classroom. The context in which technology is used and how it is used are crucial factors in how well it may support learners (Anderson-Inman & Horney, 1998; Kern, 2006). Despite their role as innovators, teachers have always had a love-hate relationship with technology (John & Wheeler, 2008:15); many trying to keep up with the latest trends and innovations, some not being bothered, while others do not have any technology to use at all. In the South-African context, there are classrooms equipped solely with a teacher who is expected to fulfil the needs of the learners for the majority of the day. He/she is expected to perform the exciting role of the techno-gimmicks which are visually attractive and auditorily stimulating. Education needs to help produce a variety of types of literacies to make current pedagogy relevant to the demands of the contemporary era (Trifonas, 2008:45). This would not only make education and learning more exciting for the learners but would also help capture their attention and improve their concentration if their teachers are using tools relevant to their world. Tailoring a program to individual learners is what makes a multimedia program an educational success. Such success in the form of learner's motivation is also caused by better understanding of and engagement with the material (Lytras et al., 2008:189). The aim of the present investigation was to determine whether the use of technology would make a difference in the attention and concentration abilities of learners in the classroom situation as well as their achievement in certain learning areas. The possible relationship between motivation and concentration was also investigated. Three hypotheses were formulated in this regard. Firstly, is was assumed that there would be is a significant difference between the average achievements of a group of learners exposed to technology during a lesson, compared with a group who received the content of the lesson in a normal, verbal way without being exposed to any technology. The rationale for this hypothesis is based on the conclusion of Khine and Fisher (2003:22, 37) that technology assists students to make meaning of the learning material and educators must therefore match appropriate technology usage in order to maximise a student's potential learning. The interactive effects of sound, animation, narration and additional definitions that make up electronic texts appeal to today's learners, motivating them to concentrate better and to deliver higher average achievement. Furthermore, a study conducted by Bitter and Legacy (2008:152), found that students have higher comprehension scores after reading electronic stories compared to those reading printed texts. In addition, an investigation of Trifonas (2008:45) showed that achievement can be improved in the classroom with the active involvement of the students making optimal use of the technological advancements. In the second hypothesis it was assumed that there would be a significant difference between the average attention of a group exposed to technology during a lesson, compared to a group who received the content of the lesson without exposure to any technology. Support for this hypothesis comes from Willougby and Wood (2008:46) who noted that learning takes place on computer software without the learners realising the amount of attention they are paying to the material. Jewitt (2006:23) provides a framework for what engages someone's attention while making use of technology and Bitter and Legacy (2008:67) found that students seem to focus on their work longer when using technology. The third hypothesis states that a significant relationship may exist between the motivation and concentration of learnerst. According to Cleary (1991:473-508) motivation relates to the willingness to concentrate. Intrinsic motivation, where a task is done because the learner wants to do it for its own sake, will result in concentration during completion of the task. This corresponds with Sigman's (2007:26) view that learners need to be motivated in order not to lose concentration in their school work. It was mentioned earlier that attention, when sustained over time, develops into concentration. The role of motivation in this process cannot be ignored. One would therefore not only expect to find a correlation between motivation and concentration but also between motivation, concentration, and attention taken jointly as independent variables and achievement as the dependent variable. To test these hypotheses the following investigation was carried out. An experimental investigation in the classroom was decided upon as the mode of inquiry for this study. The study was conducted in two phases. The first phase is a self-completion questionnaire, which learners completed at school, measuring concentration and motivation. This was followed by the second phase, consisting of a series of lessons where the experimental group was exposed to the lessons making use of technology in the classroom, while the control group was given the same lessons verbally by the same teacher but no technology was used. Achievement and attention tests were given directly after the lessons which were marked by the teacher and the results were filled in on the learners' questionnaire forms. The target population of learners sought for the investigation falls in the 12 to 13 year old, technologically active age group. They are at the beginning stages of formal operations according to Piaget's theory and are therefore starting to outgrow the concrete operational phase. The first year of high school was seen as an ideal age for the investigation. Permission obtained for access to state schools is time-consuming and often rejected by one of the role players concerned. For the purposes of this study, learners at an accessible independent junior college were approached to take part in the investigation. This independent school is situated in Gauteng province, specifically located in Centurion. The college has two Grade 8 classes consisting of 22 learners in the one class and 23 learners in the other. The learners are randomly selected to the classes at the beginning of each school year, ensuring that the classes are not specifically streamed, nor are they grouped according to any other criteria. The classes are therefore accepted to be analogous in every aspect. Due to the relatively small sized classes in the school, non-probability sampling was used where the entire class became the sample. The classes were randomly assigned to the experimental group or the control group, thus making use of the static-group comparison. The sample can be viewed as representative and balanced. As can be seen in Table 1, of the total sample, 71% spoke English as a home language, 16% spoke Afrikaans, and 13% spoke an African language at home. With regard to the total sample, 56% were boys and 44% girls which indicates a balanced gender composition. Based on the hypotheses stated previously, achievement, attention, concentration and motivation were to be measured. A 40-item self-completion questionnaire was given to all the learners in the sample. The questionnaire consisted of 40 items, 20 measuring motivation and 20 measuring concentration. The learners had to respond on a 6-point scale. To ensure content validity the preliminary questionnaire was reviewed by competent readers to ensure that the items included were relevant for the current research. The questionnaire was piloted at an independent school in Gauteng, in order to test the instruction set, as well as the content of the questionnaire. The pilot school is similar in structure to the school used in the research, therefore eliminating possible interfering factors. Slight alterations were made after piloting the questionnaire and a few of the items were reshuffled in order to ensure that they were randomly presented in the survey. The pilot study proved to be of great help in defining the relevant items. An item analysis was done on the final questionnaire using the data of both the experimental and control groups. No items needed to be deleted. An alpha-reliability coefficient of 0.90 was obtained for the motivation section, and 0.93 for the concentration section. Both coefficients indicate high reliability. An identical 20-mark achievement test was given to both groups at the end of each lesson. Ten marks tested direct content of the lesson while the other ten marks tested attention by asking questions that related to small details given during the lessons. The learners answered the questions individually and wrote the answers in the spaces provided in each test. Most questions required only single-word answers, which could easily be marked right or wrong. This was done to enhance objectivity in the marking process. The answers to the questions tested under the content section of the test related to the content which was presented during each lesson. However the attention section incorporated questions which could only be answered if one had paid attention to the subject matter and details during the lessons, as they were subtly included in the presentation of the material. During the administration of each test, every question was read out aloud by the teacher in order to assist any learner who may have had a reading difficulty and who may therefore misinterpreted or misread a question. After reading out the question, each learner had to respond by writing down his/her answer. This was done for both the experimental and control groups. The results of the achievement tests were collated and filled in on the learners' original questionnaire forms. These results were analysed statistically for interpretation purposes. Completion of the motivation and concentration questionnaire was carried out with the entire sample in one central venue, in order for the instructions to be consistent for everyone and in order to eliminate the possibility that time, weather conditions, length of time without food and other potential factors could influence the results of the survey. This also eliminated the fact that learners could discuss the items and influence each others' results. No pressure was placed on the learners to complete the survey within a certain time-frame. The learners were told to read each item carefully and to think honestly about each item. The learners were given the opportunity to ask for explanations if items were unclear to them or if there was any uncertainty that arose over the questionnaire. The learners completed the survey in pencil so that they could change an answer if they felt another scale number was more appropriate when rereading and checking their answers. Approximately 30 minutes was taken to complete this section of the questionnaire. These questionnaires were then collected. A series of three 40-minute lessons were then carried out over a period of a week in the following learning areas: Geography, English, and Mathematics - one teacher conducted all the lessons. Each learning area lesson was presented to the experimental and control groups on the same day and in consecutive school periods, in order to eliminate factors such as time of day, hunger, and fatigue. This also eliminated the possibility of learners discussing the lessons with learners from the other class. The same lesson was presented to both classes during school time. One difference in the lessons prevailed: the experimental group was exposed to some form of technology during the lessons, whereas the control group was presented with no technology during the lessons. The content was communicated verbally. The identical content was administered to both groups and the same wording was used during both lessons. The country of choice chosen for the Geography lesson was Vietnam. This country is not included as a 'country of study' in the South African Geography syllabus. Vietnam was therefore selected as very few students would have background knowledge on the country, which could taint the results. The experimental group was shown a 'Powerpoint presentation' connected from the computer to the visualiser in the classroom. This included visuals of the Vietnamese cuchi tunnels and the surrounding Vietnam countryside and people. The control group was given the identical information and lesson but had no access to the technology. Both groups were administered the achievement test directly after the material had been presented. The learners completed this individually in the classroom. The tests were collected and marked. These marks were written on the learners' questionnaires in the appropriate spaces provided on the form. An unseen English poem was explained to the learners during the English lessons. The experimental group was exposed to an auditory tape while expressive pictures, depicting the poem, flashed on the interactive SMART board. The teacher recited the poem to the control group who were given the same explanations but were not exposed to any form of technology during the lesson. Once again the achievement test was administered to both groups at the end of the lesson. The Mobius strip was selected as the topic for the Mathematics lesson as, once again, it is not a commonly known section in Mathematics and is generally an unknown topic to Grade 8 learners. It was decided not to choose a purely mathematical concept in order to ensure that all learners could participate and had equal chance of achieving success during the test. A video clip of the Mobius strip was shown to the experimental group while the control group was explained the identical information but was not exposed to any form of technology and therefore did not view the video in any form. As the Mobius strip is spatial by nature, a practical demonstration in both groups resulted in learners making a Mobius strip for themselves before completing the achievement test. In the light of hypothesis 1, the following null hypothesis was tested. There is no significant difference between the average achievements of a group of learners exposed to technology during a lesson compared to the group not exposed to technology. In order to test the null hypothesis, two groups of learners were exposed to lessons in three different learning areas. Group 1 (the experimental group) was exposed to technology during each of the lessons, while Group 2 (the control group) was taught the identical lessons but not exposed to any form of technology during the lessons. The control group received the content in a normal, verbal way. The stated null hypothesis was tested independently for each of the learning areas. In order to test the null hypothesis, it was necessary to calculate the mean and the standard deviation for each of the achievement tests obtained after teaching the Geography, Mathematics, and English lessons. To ascertain whether significant differences existed between the averages of the content sections of the three lessons given to the two groups, t tests were used. The t values and other data are tabulated in Table 2. According to the t values in Table 2, the null hypothesis can be rejected at the 0.01 level for all three learning areas. There was a significant difference between the average achievements of the group of learners exposed to technology during a lesson compared to the group who were not exposed to technology and only received normal verbal instruction. In each instance the average achievement of those who received technology supported instruction was significantly higher. It appears that technology plays a significant role in the achievement of learners in Geography, Mathematics, and English. In the light of hypothesis 2, the following null hypothesis was tested. There is no significant difference between the average attention of a group exposed to technology during a lesson compared to a group not exposed to technology. In order to test the null hypothesis, two groups of learners were exposed to lessons in three different learning areas. Group 1 (the experimental group) was exposed to technology during each of the lessons, while Group 2 (the control group) was taught the identical lessons but not exposed to any form of technology during the lessons. The stated null hypothesis was tested independently for each of the learning areas. As in the previous hypothesis the mean and standard deviation for each of the attention tests were obtained after teaching the Geography, Mathematics, and English lessons. To ascertain whether significant differences exist between the averages of the attention sections of the three lessons given to the two groups, t tests were used. The t values and other data are tabulated in Table 3. According to the t values in Table 3, the null hypothesis can be rejected at the 0.01 level for all three learning areas. There is a significant difference between the average attention of a group of learners exposed to technology during a lesson compared to a group not exposed to technology. The average attention of learners exposed to technology during a lesson was significantly higher compared to those who received normal verbal instruction. Based on hypothesis 3, the following null hypothesis was tested. There is no significant relationship between the motivation and concentration of learners. In order to test the null hypothesis, it was necessary to calculate the correlation coefficient between motivation and concentration. According to the results the null hypothesis can be rejected at the 0.01 level since a high positive relationship was obtained between motivation and concentration (r = 0.71; p < 0.01). The result confirms Neisser's (1976:215) stimulus-properties theory in which he proposes that motivating stimuli play a key role in optimizing concentration as well as Treisman's attenuation model (Treisman & Souther, 1986:14), which accentuates that if a learner is motivated in a lesson, he or she is able to concentrate for sustained periods of time. In the light of the underlying relationship between motivation, concentration and attention, multiple correlations were calculated between motivation, concentration and attention, taken jointly as independent variables, with achievement (in each learning area) as the dependent variable. The following multiple correlation coefficients were obtained (N = 45): Geography (r = 0.73; p < 0.01), Mathematics (r = 0.64; p < 0.01) and English (r = 0.54; p < 0.01). Moderate to high positive correlations were obtained indicating that high attention, concentration and motivation will relate to high levels of achievement, while lower achievement levels will be related to low attention, concentration and motivation. Subjects at school level can roughly be divided into languages, predominantly nonverbal material, and verbal learning material. In this investigation the language subject was English, the non-verbal subject was Mathematics, and the verbal learning subject was Geography. In all three the learning areas the application of technology instruction resulted in a significant difference between the average achievement of the learners who received technology instruction during the lesson and those who received normal verbal instruction. In each instance the average achievement of those who received technology instruction was significantly higher. This investigation should be viewed as an investigation on micro level but it does convey the important message that the use of technology supports teaching and learning and should be promoted where possible. The results of the investigation are consistent with the results of other studies such as the study conducted by O'Donnell, Hmelo-Silver and Erkens (2006:3) who found that higher levels of learning goals can be accomplished if supported by various technological applications. In another study, Bitter and Legacy (2008:152) found that students have higher comprehension scores after reading electronic stories versus printed texts of the same stories. The results of this investigation also support the findings of Khine and Fisher (2003:37), John and Wheeler (2008:48), and Smaldino et al. (2008:259). These studies emphasise that learners would retain more information with the help of sufficient stimulating technological content in their learning materials. In technology-rich learning environments, learners can explore new information, con struct new knowledge and link theories into practice, thus maximising their achievement. To ensure quality instruction the possible utilization of technology should be a priority when planning and presenting a lesson at school level. Attention was earlier defined as a system of cognitive control in which the vast amount of information processed by the cognitive system is reduced to a tolerable extent (Ackerman et al., 1999:162). Any mean in which this reduction process can be facilitated should be considered when content is presented during a lesson at school level. The use of technology is certainly one method to consider. In this investigation the average attention of learners exposed to technology during a lesson was significantly higher compared to a group not exposed to technology. This was the case in each of the three learning areas. It appears that technology succeeds in capturing and maintaining the attention of learners during a lesson. Implementing technology creates a more interactive learning environment which enables learners to use multi-modalities resulting in better attention and concentration for a longer period of time. It is not surprising because children today are visual learners having grown up with technology. Teachers should capitalise on this phenomenon. Based on the results discussed above, the use of technology can improve achievement and will most probably facilitate attention which, if sustained over time, will develop into better concentration. It should be taken into account, however, that learners are also affectively involved in a classroom context. Technology can capture the attention of learners but there should also be a willingness from their side to concentrate in order for a learning task to be successfully completed. In this respect motivation becomes an important variable. A high positive correlation was obtained between motivation and concentration indicating that high motivation can be associated with high concentration and vice versa. This finding corresponds with that of Treisman and Gelade (1980:111) who found that learners pay attention according to how motivated they are at the time. Ashley (2005:10) also agrees in this regard and points out that it is not the fact, that children cannot pay attention, but that today's children have great difficulty sustaining attention unless sufficiently motivated to do so. This is confirmed by Willis (2005:32) who states that information must motivate a learner sufficiently otherwise attention is withdrawn. One can assume that an optimal learning situation is created where the teacher succeeds in capturing the attention of learners (using technology, for example) and where the learners are motivated to concentrate on the learning task. The multiple correlations obtained in this investigation between attention, motivation, concentration (taken jointly) and achievement in each of the learning areas, support such an assumption. Moderate to high positive correlations were obtained. In a language subject (in this instance English) r = 0.54, which implies that 29% (r2 = 0.29) of the variance in achievement based on the content of a particular lesson, can be explained by attention, motivation and concentration. For a non-verbal subject (Mathematics) it was 40% and for a verbal learning subject (Geography) it was as much as 53%. One can expect that the variance in achievement explained by attention, motivation, and con centration will differ from lesson to lesson depending on the amount and difficulty level of the content, but from the results of this investigation one can predict that attention, motivation and concentration may explain 29% or more of the variance in achievement after a lesson had been presented. This is a substantial proportion considering the fact that only three variables were used in the model. Other variables which relate to achievement such as aptitude, intelligence, learning style and self-concept which were not taken into account in this investigation, will most probably add to the unexplained proportion of the variance in achievement. In conclusion, the objective of this investigation was to determine the effect of technology on attention and achievement within a classroom context, also taking motivation and concentration into account. From the results of the investigation it appears that achievement will be very likely to improve if technology is used in a lesson to capture the attention of learners and to maintain their concentration. If the learners are motivated to learn and to concentrate, the possibility of higher achievement increases. Although technology will never replace the human aspect of teaching, it has become a necessity within the modern day classroom and therefore teachers should be less reluctant to make use of it. Technology can also contribute to better classroom management. If teachers can capture the attention of learners during lessons they will not only accomplish good academic results, but they will most probably experience less discipline problems in class as well. Investigating such a possibility could be the aim of a future research project.